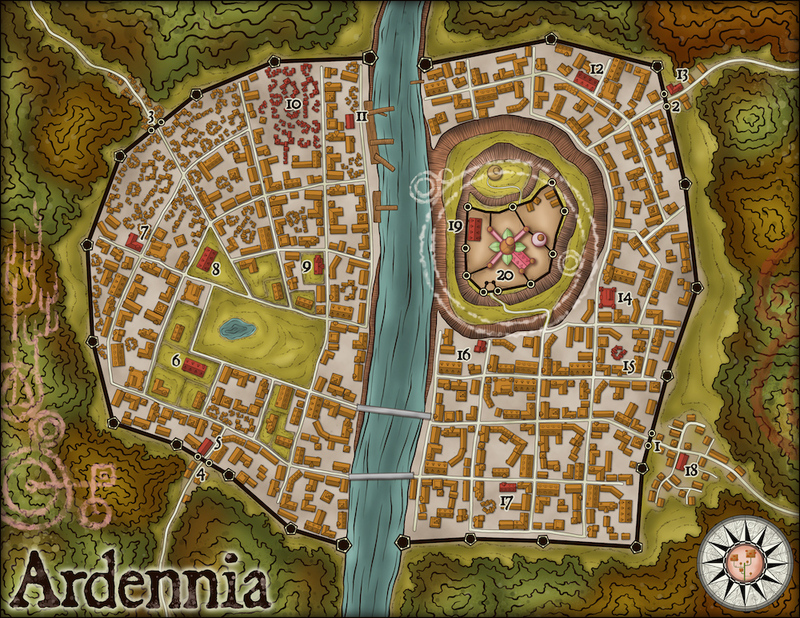 This resource features the general description of Ardennia, the fey-ruled capital of the kingdom of the same name. 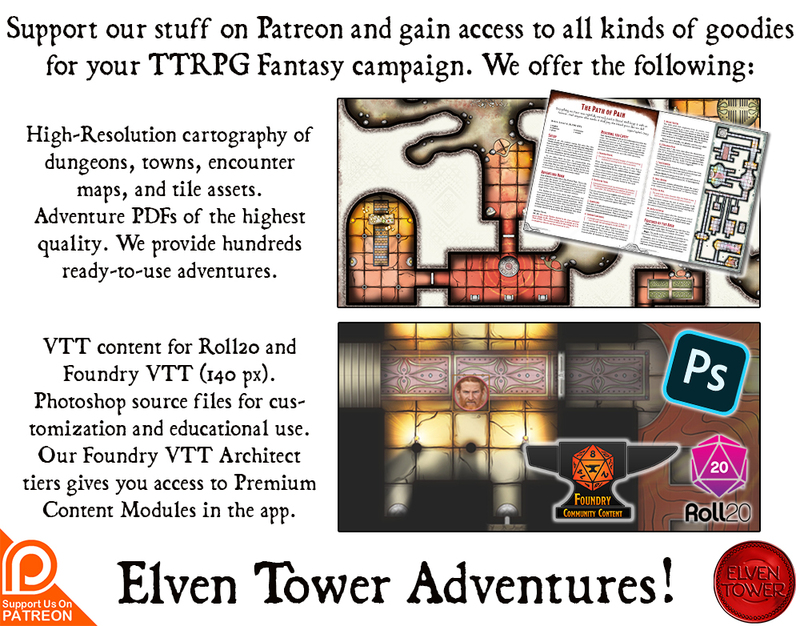 It includes adventure ideas that are appropriate for low to mid-level (Levels 1 to 10) adventur­ing parties. Challenge Rating (CR) is calculated using a party of four as the model. Ardennia is a bustling metropolis in an unlikely location. It lies in the middle of the Whispering Forest, completely surrounded by forest. The Arden River goes through it and parts the city in half. The city is not as inaccessible as it may appear. Four well-kept roads traverse the forest to connect other settlements in the kingdom with Ardennia. These roads are safe for travelers and merchants alike. Things were not so in the past. Two centuries ago the city and the kingdom were very different places. The Whispering Forest did not exist. It was planted by the growing fey faction after the last human king died. As some human settlements prepared to resist a siege, a several kilometer radius surrounding the city had been cleared of obstacles. They did this to secure exit routes and to have the advantage over an approaching enemy. The fey do things differently. The forest surrounding the capital is a wall in itself. No heavy siege equipment or cavalry can move through the forest, it is dense enough to prevent it, except on the main roads which are well surveyed. Large armies are forced to squeeze through the main road or go through the difficult terrain of the forest. Worst of all is the fact that most soldiers in the fey armies are at home in the forest environment and can ambush their enemies from above or below. This is truly what earned the kingdom the surname “Bastion of the West”. Over the last 200 years, there have been three invasion attempts. All of them a complete disaster for the attacking faction. Ardennia is now relaxed in its defensive position. Another thing that changed after the last human king died is the royal castle. The castle is located on the top of Arden Hill. A single road connects the castle with the city proper. No human remembers what it used to be like before; all records and drawings of it were destroyed by Queen Ai’Haranna’s command. Perhaps its architecture is similar to that of the Lord’s Hall in Trudenport. The new castle was built over a period of ten years. The queen named it the Palace of Petals after the flowery shape of the main tower and the adjoining rooms. They kept the inner walls that surround the palace itself. The palace is a magical place of portentous magnificence. Lustrous marble floors, decorated walls with bas-reliefs and gold inlays, frescoes painted on all ceilings depicting marvelous landscapes of the Feywild, obsidian and emerald statues of unknown entities from the Feywild Courts. The central tower shoots above everything else like a needle trying to reach the clouds. The central spire holds the queen’s chambers, her arcane laboratory, and other facilities exclusive to her. Known only to the queen and her most trusted advisors. The Palace of Petals was fitted with an artifact of incredible power. It is a lapis-lazuli orb attuned to the Feywild. The artifact is hidden inside an adamantine safe in the queen’s arcane lab. Upon activation, the orb creates a rip in the fabric of space strong enough to pull anything surrounding it into the Feywild. Its power is such that it is believed that it can take the whole palace and inner walls back to the Feywild, but it has never been used. This is an escape measure of last resort. Life in the capital is dependent on race and ancestry. The political divide in Ardennia is the strongest in all the kingdom. Fey ancestry or origin is the only thing that separates the haves from the have-nots. Elves are on the privileged side of things, but that’s the very minimum of fey ancestry one needs to be respected. 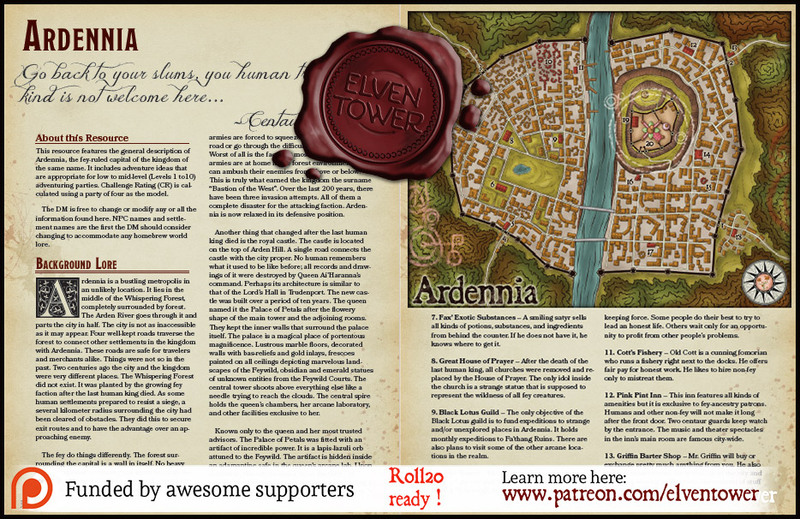 Half-elves get no recognition whatsoever, sometimes they are treated worse than base humans. The fey oligarchy of the kingdom and capital is strongest here. 50% of the city’s population is of fey ancestry. The remaining citizens are mostly human and form the lowest link of the chain. Most non-fey live in the outside small settlements of Ardennia or within in one of the many sums. By royal decree, non-fey cannot own property within the walls of Ardennia, nor can they represent the people in the Fey Court. The better off portion of the non-fey population are the ones who serve in the homes of powerful fey. They receive fair wages and have most of the city open to them, the most fortunate ones serve a fair lord who finds no joy in mistreating non-fey, like members and supporters of the Yellow Leaf Council. The council has tried to improve the lives of non-fey over the years with little to no success. Ardennia’s Watch is the main peacekeeping force in the capital. Most of its officers are elves and satyrs. Contrary to common belief, the watch does not focus its attention on non-fey. They are considered a waste of the watch’s resources. Some fey are savage and cunning and those are the ones the watch is looking for most of the time. This results in no laws or punishment for criminal in non-fey slums. High profile situations are always the priority for the Order of the Petal. This organization of elite soldiers and magic-users reports directly to Queen Ai’Haranna. They antagonize the efforts of the Thornheads in their quest of returning the kingdom to a human government. Silent Gate – The road out of the Silent Gate leads to Trudenport. It is less than a day’s travel there. Many non-fey live in the small settlement outside of the gate. North Gate – This road leads to the Ai’renu Outpost and later Herbalia. Western Door – This road leads directly to Fa’thang Ruins where the road goes south and connects to Ai’Tiranu Outpost and Forest Ridge. The road is dangerous in proximity to the old ruins. An extension of the slums follows the road outside of the gate; only non-fey live here. South Gate – This road exists the forest in less than two hours and continues southwest towards Jaytown. Main Stables – Public stables for travelers and merchants. The fee is one copper coin per night and includes food for the mount and a daily brushing session. Lord Fatiner’s State – Lord Fatiner is a wealthy pixie fey lord who supports the movement of the Yellow Leaf Council. Lord Fatiner often hires adventurers of all kinds for diverse objectives. There are rumors that he secretly funds the Thornheads. Fax’ Exotic Substances – A smiling satyr sells all kinds of potions, substances, and ingredients from behind the counter. If he does not have it, he knows where to get it. Great House of Prayer – After the death of the last human king, all churches were removed and replaced by the House of Prayer. The only idol inside the church is a strange statue that is supposed to represent the wildness of all fey creatures. Black Lotus Guild – The only objective of the Black Lotus guild is to fund expeditions to strange and/or unexplored places in Ardennia. It holds monthly expeditions to Fa’thang Ruins. There are also plans to visit some of the other arcane locations in the realm. The Slums – Most non-fey live in the slums north of the city and the ones next to the Western Door. Life is rough in here as there is no peacekeeping force. Some people do their best to try to lead an honest life. Others wait only for an opportunity to profit from other people’s problems. Cott’s Fishery – Old Cott is a cunning fomorian who runs a fishery right next to the docks. He offers fair pay for honest work. He likes to hire non-fey only to mistreat them. Pink Pint Inn – This inn features all kinds of amenities but it is exclusive to fey-ancestry patrons. Humans and other non-fey will not make it long after the front door. Two centaur guards keep watch by the entrance. The music and theater spectacles in the inn’s main room are famous city-wide. Griffin Barter Shop – Mr. Griffin will buy or exchange pretty much anything from you. He also sells all kinds of stuff. He is famous in the city and even neighboring settlements, the amount of stuff that goes in and out of his establishment would daze the most cunning accountant. Order of the Petal – A small walled manor serves as headquarters for the Order of the Petal. The leader of the order is a centaur knight named Ardeus. He answers directly to the queen. Flower Market – A small market that opens only during the night. The sellers only deal in light-producing kinds of flowers. Elven bards and minstrels are often around to sing songs from the old realms while the flowers shine in the night. Larissa’s Smith shop – Larissa is a female satyr who owns the largest smith shop in Ardennia. Eight apprentices work non-stop in her shop every day. She provides elite weaponry to the Order of the Petal and the Watch. Her work is the best in the kingdom. However, ordering a piece of armor or weaponry from her means waiting months before she is able to begin. Perfume Shop – Mrs. Adulant is a distinguished elf who offers the best perfumes in town. Some of her best essences are good enough to fool savage creatures into fleeing or coming closer. These exquisite perfumes are the result of not only her expertise in perfumery but also potent charms. She sells a famous “Love Perfume” that goes in and out of fashion several times per decade. Fishy Inn – The Fishy Inn is outside of town in the small community outside of the Silent Gate. Contrary to other lodging establishments within the city, the Fishy Inn will take anyone’s money. Fey Court Building – The Fey Court holds meetings in this building every week. The building is guarded by 20 elements of the Order of the Petal when the court is in session. Palace of Petals – The Palace of Petals is the home of Queen Ai’Haranna. It is considered to be the most impregnable structure in the whole kingdom. These are the general features of Ardennia, the capital. It is surrounded by the Whispering Woods a the Arden River goes through the middle of the city. Four different roads connect the capital with other settlements. Terrain. The forest that surrounds the capital is dense enough to prevent any kind of siege weaponry or cavalry to move through, except on the main roads. Gates. The four gates to the outside world open at dawn and close at sunset. No creature is allowed in or out during the evening and night. A toll of 1 silver piece is charged to any foreign visitors on first entrance. Light. Lighting conditions are dependent on the time of day and weather. The roads are in the shade during most of the day, though. Smells and Sounds. The verdant smell of greenery, pines, and rushing water is ever present. These natural smells merge with the more mundane smells or city detritus and people.